Use these 12x24 barn plans to build yourself a super size storage shed, shed home, tiny house, small cabin, craft studio, or backyard home office. Your 12x24 barn plans include all this..
17 page Comprehensive and detailed building guide. 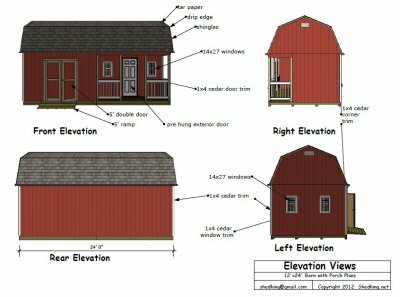 Build a Tiny House with these 12x24 barn plans! Our Interactive 3d pdf file mentioned above allows you to zoom in, pan, and rotate to see all building aspects of this barn. This is really cool if you have a question about or are not sure about a particular building aspect of the plans. You can zoom in on the door framing, porch framing, loft framing. 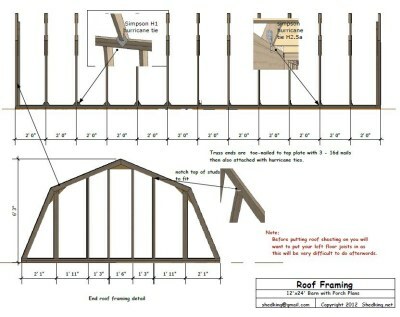 Or check out the detailed graphics of anchoring your trusses down with hurrican ties! The detail is tremendous with this interactive file and its all included with your instant download. In order to view you should have the latest update version of adobe acrobat. Check out my video on you tube of this 12x24 Barn. 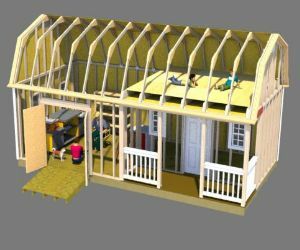 Show below are a few samples of the plans you get with your 12x24 barn plans download. All phases of the construction of this small barn are in full color and are full pages of detail. 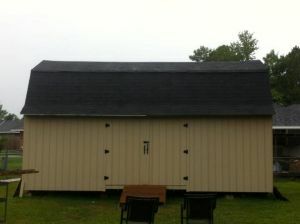 This small barn has plans for building a huge loft in the storage area. If you chose to this barn could even be used for building a nice small home and you could have your sleeping bed located in the loft area. Big loft for lots of storage. Your instant download for $24.95 is in pdf format and you should have the latest version of adobe pdf reader to view the interactive pdf file included with the plans. 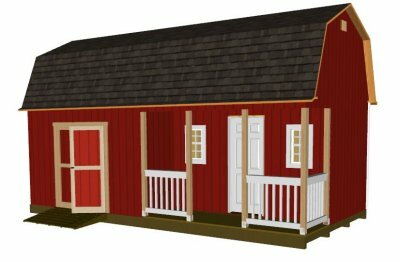 You can purchase and download the 12x24 barn plans through paypal with the Buy Now button below. Please make sure to be able to receive email from shedking.net and e-junkie.com. If you don't immediately get the instant email with download link check your junk or spam email folder. If this still doesn't work, please email me right away and I will send the plans as an attachment to your email address. 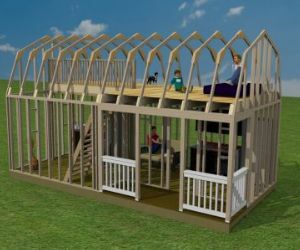 Charles's used the plans to build his 12x24 barn. The amount of storage space in this shed is huge! Charles modified the plans somewhat and did away with the front side porch and front double shed doors. 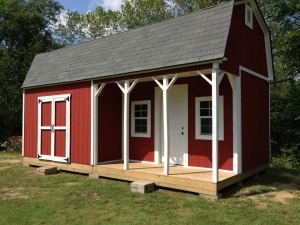 Tracey and his wife used my 12x24 barn plans to build this small cabin in the woods. The loft area in this shed is huge and makes for a nice sized bedroom. 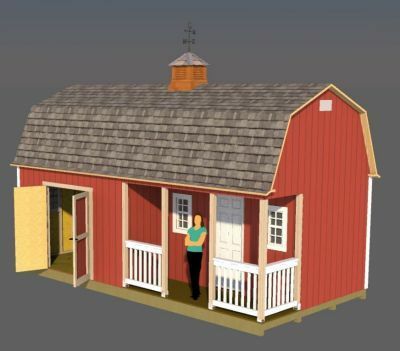 This is exactly how your barn shed will turn out by using my 12x24 barn plans. 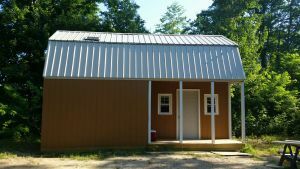 A nice front porch, 5' wide double shed doors, huge loft area, and large floor space downstairs to use for your workshop, craft studio, tiny house, small cabin, or backyard home office. If you build this neat barn, don't forget to email me your pictures! Thanks for visiting my site.